As the Super Bowl LIII event period begins this weekend, we wanted to provide links and resources to help address questions our community members have (or might soon have) regarding how to commute to Downtown for work, school, and beyond. How many people are coming into town for the event? When are they arriving? It’s anticipated that Atlanta will welcome 150,000 out of town visitors for Super Bowl LIII. The most noticeable influx of visitors will begin on Thursday, January 31 and last through Game Day on Sunday, February 3. Monday, February 4 will be a large egress day for out of town visitors heading to the airport to fly home. Please be mindful, however, that official, sanctioned, and related NFL events, including Super Bowl LIVE and Super Bowl Experience, will begin to take place as early as Saturday, January 26. You can learn more about these events at ATLSuperBowl53.com. I work in Downtown Atlanta. Will I be able to get to my office? Will clients, customers, and employees be able to get to the office? Great work has been done to ensure the impact of the event is minimal during business hours. However, it is recommended that employers, employees, and others accessing Downtown Atlanta during the business day leverage public transportation, rideshare, flex time, working remotely, and other tactics to ensure smooth operations during the event period. We specifically recommend utilizing these measures on Thursday, January 31 and Friday, February 1. Where can I find information about parking, road closures, public transportation, and rideshare? The Atlanta Super Bowl Host Committee is the official local host organization, and their website, ATLSuperBowl53.com, is your go-to resource for this information. I normally drive and would like to learn more about how to use MARTA. Great! 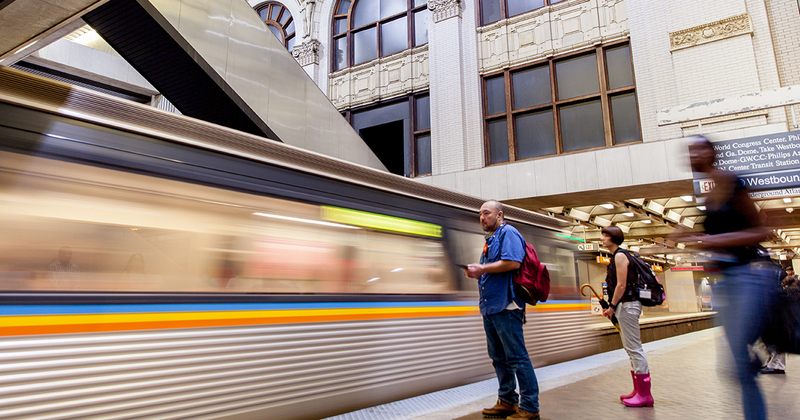 We recommend visiting this page on MARTA’s website for a nice overview of trip planning, driving to and parking at stations, purchasing fare, and more. I live outside the perimeter. Are there public transportation options available to me to help me get Downtown? CobbLinc, Gwinnett County Transit, and GRTA Xpress are great options for commuters living near a Park and Ride. Is there someone who can help me with route planning? Yes! If you commute to Downtown for work, we’re happy to help consult with you about your options and the most optimal route. Contact us at connects@atlantadowntown.com. Subscribe to the Downtown Navigator, our weekly newsletter reporting impacts to traffic and travel in Downtown Atlanta. We’ll be sending out a few extra editions next week to keep you up to date on information related to the big game. Utilize our Downtown Connects program. We offer commuter support for employers and employees in Downtown Atlanta year-round.